If you have questions about our Vinyl Patio Kits, refer to the helpful resource below OR Contact Us for more information and our customer service team will get back to you promptly. 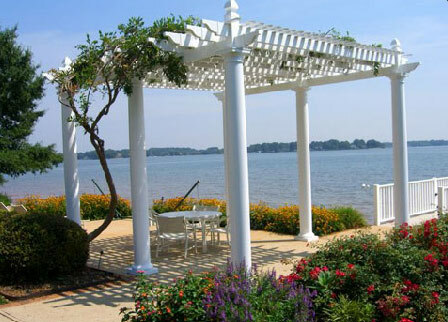 What are your patio covers and pergolas made of? All of our vinyl products are fabricated using 100% virgin vinyl chloride (PVC) that is infused with impact modifiers. The materials are weather resistant and will never rot, rust, chip or splinter. We also include a galvanized steel insert in every support beam and support post for added strength and durability. For more information about vinyl, please click here. Will vinyl discolor and turn yellow? No. Our vinyl products contain titanium dioxide (TiO2) that protects the vinyl from UV light, which is the cause of yellowing in other materials. Our vinyl is color stable so the colors will not fade or discolor like wood and other plastics. Your vinyl patio cover is engineered to maintain its true color for a lifetime and is backed by a Lifetime Warranty against yellowing. Will weather affect my vinyl patio cover? Weather, sunlight and other environmental factors will not negatively affect your vinyl patio cover. Be assured that your vinyl patio cover is made from 100% virgin polyvinyl chloride that is guaranteed to not warp, rot, discolor, crack or peel due to the harsh effects of weather and sunlight. Titanium dioxide and impact modifiers are added to the vinyl to make sure your patio cover will hold up in even the most extreme weather conditions. If subjected to direct impacts, such as from being hit with a sledgehammer or an automobile collision, chances are your vinyl patio cover will sustain damage. However, it will not break due to wind or weather, because the vinyl we use to manufacture your vinyl patio cover has five times the tensile strength and four times the flexibility of wood. That’s because we infuse our products with impact modifiers that make the vinyl extremely strong and durable. We also make our patio kits even more rigid by using galvanized steel inserts inside every support beam and inside every support post. This ensures that your patio cover will hold up in high winds and heavy snow loads. How does your vinyl patio cover stand up to wind and snow? We are one of the very few companies that includes a galvanized steel sleeve inserted into each vinyl support beam for rigidity and added support. We also include a galvanized steel post base within each support post, which provides your patio cover with superb strength and durability against high winds and heavy snow loads. Can I trust that my children will be safe playing around my vinyl patio cover? Be assured that your vinyl patio cover is safe, durable and strong. Unlike wood, vinyl will not splinter or peel and because the vinyl exterior is smooth and all of the fasteners are hidden, you don’t have to worry about your children being injured by a rough surface or protruding hardware. And, with vinyl, you also don’t have to worry about exposing your children to harmful chemicals such as Arsenic, Lead and Creosote, which have typically been used to treat wood products. Your vinyl patio cover is enforced with a solid galvanized steel insert that provides the patio cover with rigidity, so it won’t warp or sag. Can I use my lawn mower near my patio cover? It is advised that you use caution when using lawn mowers, hedge clippers and weed eaters near your vinyl patio cover, as the blades and flying debris can cause damage to the surface of the vinyl. It is also important to avoid ramming your vinyl patio cover with a lawn mower or other heavy device. Will my vinyl patio cover meet my state’s building codes and do I need a building permit? All of our vinyl patio covers are engineered to meet specific structural requirements. 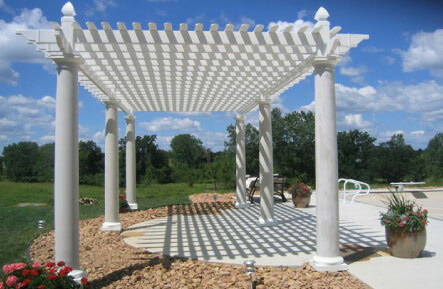 The building department in your city or county may require a permit for construction of a pergola. If a permit is required, the structural specifications sheet should provide all of the necessary information required. You may download the structural specifications here. How tall are the posts? The posts are shipped at 12′ long so that the height can be adjusted somewhat. 8′ is the recommended height of the pergola. Due to heights of windows, overhangs, or other factors, heights may vary. Also, when the posts are installed onto a concrete pad or into the ground, they may not be completely equal in height and will need to be trimmed to match. Are your kits easy to install? Yes! Installation requires only 12 easy steps and two people can install the average patio kit in under two days. Once you have ordered your kit you can download our step-by-step installation instructions that are very detailed, yet easy to follow. What tools will I need to install my vinyl patio cover? You’ll most likely already have all of the tools you need, right in your garage! If you have a hammer, circular saw, wrenches and a ladder, you’re set! After purchasing a kit, you will receive instructions that will remind you exactly what tools are required for a patio cover that is either attached to your home or is freestanding. Will I have to make any cuts to install my vinyl patio cover? Yes. Pergola support posts will be cut to length during the installation process. On all standard pergola kits under 15′ in length, the support beams, joist and slats are pre-cut for your convenience. Any deviation from the kit dimensions may require additional cutting. Will your kit work with my existing patio? All of our kits come with galvanized steel post bases that can be mounted on existing concrete patios and wood decks. How do I know if I should get a freestanding patio cover or one that attaches to my house? Ninety percent of the kits we sell are attached to the house. Sometimes (especially on single story homes) the eve of the roof line will not allow for attachment to the house, therefore you will need to go with a free standing patio cover. What colors are available for my vinyl patio cover? Why can’t I get a vinyl patio cover in a darker color? As with any material, dark colors fade and deteriorate much more rapidly than do light colors. Currently, the technology is not available to manufacture vinyl products in dark colors that will last the life of the product. Because we guarantee your vinyl patio cover for a lifetime, we won’t sell you a product that cannot be guaranteed to last. Do you offer sizes that are not listed on your Web site? Yes. If one of our 24 standard sizes will not work for your needs, please contact us with your dimensions and we’ll give you a FREE estimate on a custom patio cover. We can make virtually any size patio cover. 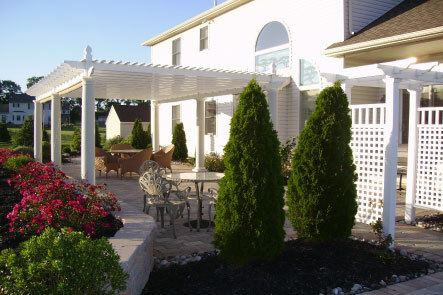 For more information on customizing your vinyl patio cover, please click here. If you need assistance in gathering the information you need give us a call at 800-230-0692 (9-5 MST) and our team of experts will help you get started. What is the warranty for my vinyl patio cover? Your vinyl patio cover is backed by a No-Risk Lifetime Warranty against rotting, warping, sagging, discoloration, cracking and peeling. Your vinyl patio cover is guaranteed to last the life of your home, plus. Learn more. What are the advantages to buying a vinyl patio cover over a wood patio cover? Wood patio covers require annual maintenance that involves painting, staining and treating, which not only costs you money but also takes up much of your time. Your vinyl patio cover from VinylPatioKits.com is virtually maintenance free because, once installed, it will not require further investments of your time and money. Simply rinse off your vinyl patio cover with your garden hose to remove dirt and debris. Also, unlike wood patio covers that are at the mercy of weathering and moisture, your vinyl patio cover will not warp, rot, peel, or splinter, which means you won’t have to repair or replace it. What is the cost comparison between wood and vinyl? If you compare the cost of vinyl to premium wood, the expense is nearly equal but, generally, the initial cost of vinyl is greater than wood. However, considering the rising costs of lumber and the long-term expenses of maintaining your wood patio cover — annual staining and treating, painting, repairs and replacing — vinyl is the wiser investment. Your vinyl patio cover will surpass the life of your home and is virtually maintenance free! Once installed, all you need to do to maintain your vinyl patio cover is occasionally rinse off dirt and debris with your garden hose. That’s a cost of pennies compared to the thousands of dollars you’ll spend maintaining your wood patio cover. Is vinyl safe for the environment? Vinyl is an environmentally wise choice. Not only does choosing vinyl over wood help protect old growth forests, you’re assured that your patio cover is free of harmful cancer-causing chemicals like Arsenic, Lead and Creosote, which are often used to treat wood used in patio covers, fences, decks and playgrounds. This just isn’t safe for your family! And because vinyl far outlasts wood, your patio cover won’t end up in a landfill after only a few years. In fact, your vinyl patio cover is designed to last the lifetime of your home, and then some, guaranteed! Vinyl is the safe and friendly choice for your family. How do I clean my vinyl patio cover? Cleaning your vinyl patio cover is easy. Simply hose off dirt and debris with water from your garden hose. For caked on mud, saturate with the hose then wipe off excess mud with a wet sponge. You may also use a mild cleanser, such as dish soap. Do not use bleach or solvents as these chemicals will damage and discolor the surface of your vinyl patio cover. Once you place your order it takes two to three weeks to get your kit. Sometimes the wait may be a little longer during our busy season. Some of the delay is due to shipping and where you are located. Nothing! You get FREE shipping on all of our patio covers. Learn more about our shipping policy. The whole process was easy, from the patience of the sales staff to the install. The directions were very easy to follow and the material quality was better than I had expected. Two days, two people, too easy.